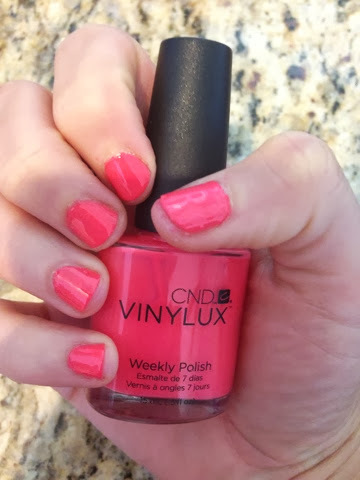 I have been wanting to do this CND VINYLUX nail polish review for some time now - so here you go! This is a non-sponsored post. 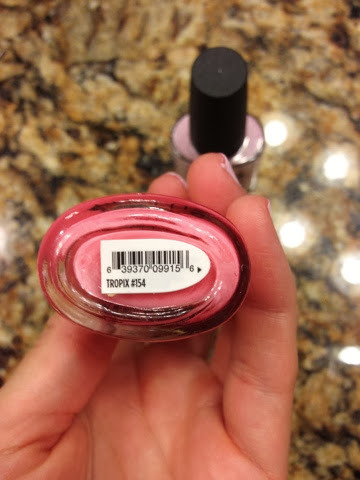 I did not receive anything for free - I actually heard that you couldn't buy this polish unless you were a salon, but I bought mine on Ebay.com and I think you can find some on Amazon.com - maybe other places by now, but I bought my 1st ones a couple of months ago after a blog and Instagram friend recommended it to me. Nail Polish does NOT EVER stay on my nails. I must have a moisturized or oily nail bed, because I can't keep a regular polish manicure on my hands for 1 day to save my life. ACRYLICS - I have done the acrylics thing and I actually got fungus (ew, i know) under one after taking a bath last time I decided to re-live my high school days and try french tips again. I loved the strength and length and perfection of them - but that experience was gross and terrifying. Never again, unless I buy some from CVS.com that last a couple days and take them off myself! 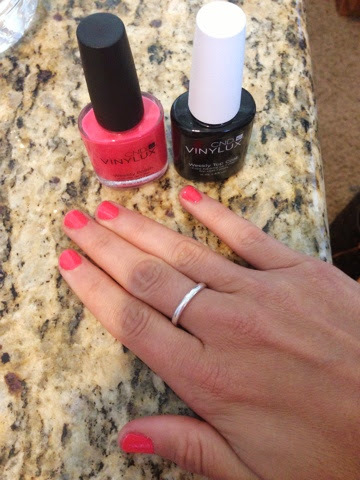 SHELLAC/ GEL - I was elated when this trend started. I actually went to the salon quite a few times to get gel nails done. I love how they are shiny and last so much longer than a manicure. They didn't last too long on a beach vacation, but I usually got a good week out of them til they started to peel off. The thing I hated most was sitting at the salon with foil on my fingers to remove it (before that, they actually were scraping it off my nail and sanding it down, and it was very painful!) -- and the whole process of getting them on and taking them off just took forever only to have nice short nails for a week. I even purchased the SensatioNail Gel Nail Kit by Nalene, with a few colors from RiteAid.com or Amazon.com, I cannot remember which one. I liked being able to do it at home, but it did peel a little faster, and 1 nail touch ups as they chipped were a little time consuming, because you don't want to do the whole process every few days to touch up the entire mani. 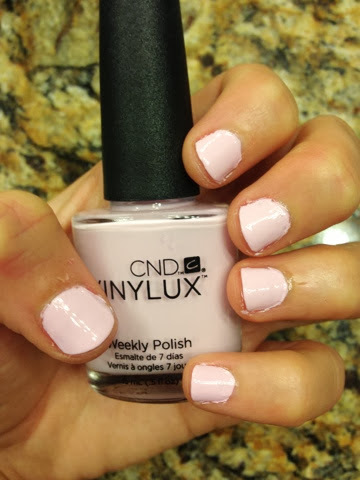 CND VINYLUX - welcome to my life! Like I said, I bought mine on Ebay.com, and I just looked - they do have them on Amazon.com - some examples HERE - of the ones I bought. 7/15 Monday - I tried out the Tropix. You do 2 light coats of the base color, and then a coat of the top coat. I actually just purchased a 2nd top coat to have for back up since you use that the most and might need to touch up the top coat. I really want to try some other colors too, but I can't decide which ones! Maybe a white color and a dark color for fall!? I chipped 3 that Tuesday (the next day) - they started to peel off where the cuticle was. FEAR NOT - I learned not to go over your cuticle, obviously because it will peel off from there once it comes off your skin. So, on 7/15 I re-polished those. 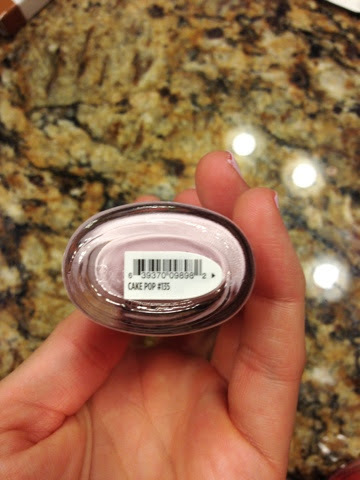 This product dries fast, and the top coat is thick and kind of gooey. Dries fast ladies!! Love that! So, several days later on Sun 7/20, the nail polish was still on but the edges were wearing off on top and all around the bottoms a little. Tried it with my 1st bath.. 1 finger's polish peeled all the way off, so I painted it again.. And tested just reapplying the top coat to the other fingers on the left hand. Not bad. 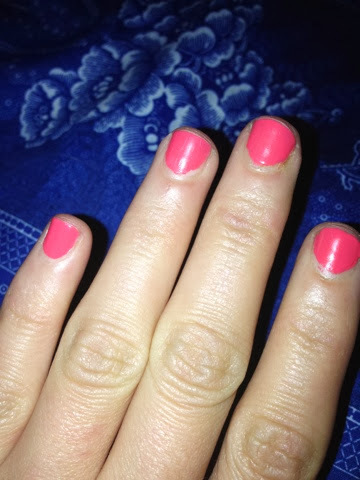 7/22 still on the right hand for 1 week but tops were chipping - so I removed all of the polish to get ready for a trip.. Removes sooo easily! Easier than regular polish even, and you just use regular nail polish remover and cotton. Nothing like gel removal, so that was a relief! The color bubbled up some because it was watery but ended up looking nice. Jamaica test! They held up ok in Jamaica on my vacation, but I wasn't in the water a ton. I brought the bottle and touched it up as necessary on the trip so I could look put together. All in all, this a new product that I really like and am excited about. 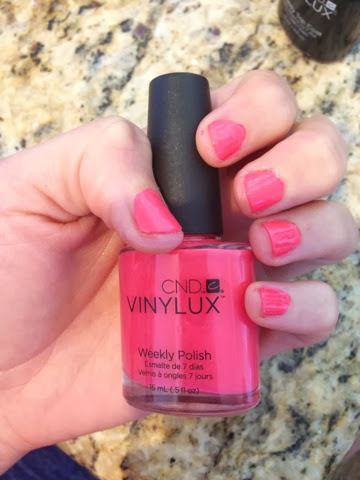 I even used an orange Essie color and put the top coat on from Vinylux, and that seemed to stay put better than normal Essie and Essie Top Coat! What nail polish colors do you think are hot for fall coming up? Let me know! Have a great weekend fit fashionistas! Banana Republic Deal of the Day! WIAW #5: Zevia Review and Giveaway! Tory Burch Fashionista Deal of the Day! MIMM #9: Glamping & Summer Luv.